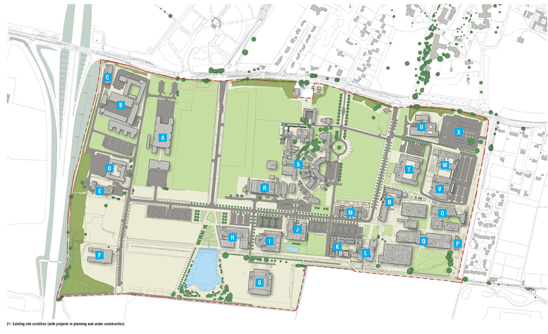 The West Cambridge site covers a 66 hectare site on University land. Its site boundaries are Madingley Road to the north, Clerk Maxwell Road to the east, the Coton Footpath to the south and the M11 to the west. The existing West Cambridge site is home to a number of major academic research occupiers including the Cavendish Laboratory, the Whittle Laboratory and Department of Veterinary Medicine. Commercial research and research institute occupiers to the western side of the site include Schlumberger, Aveva and British Antarctic Survey. There are currently construction works for the Maxwell Centre for the Department of Physics, the Chemical Engineering and Biotechnology building, and the CAPE Extension as part of Electrical Engineering. The remainder of future development on the West Cambridge site will take into account the review of the masterplan so the area can be brought forward with cohesive design principles that reflect the vision of the scheme. Click on the plan below to view a larger image of the site. made it difficult to provide social facilities (shops, cafes, restaurants) for users on the site. 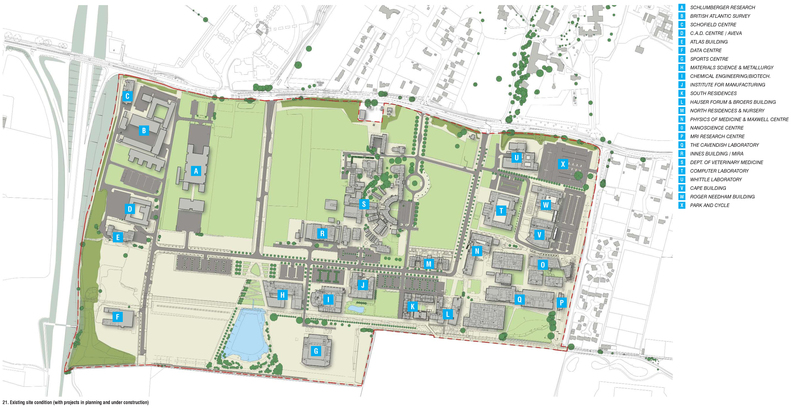 The masterplan review is the opportunity to set out the vision and principles for the development site, that will meet the University's needs for the next 40 years.